Day 4 was blown out. Some of the fleet gave it best and went home, but the weather report for day 5 (Tuesday) was auspicious, and so the remainder gathered before 7 am to hoist sail. The promised northerly breeze turned out to be a northerly zephyr - so those sails didn't have much to do for a while, and oars were more effective. Martin and Deb caused some mirth by maintaining a reef - their Lazy E must be VERY twitchy - but the rest of us did little better with all our canvas set. Somewhere between Middleton and Gordon we gave up and took a tow past the Gordon Corner, where a beautiful southeasterly sea breeze kicked in. We rollocked along past Arch Rock, Huon Island and then Garden Island when a decision had to be made about whether or not to stop at Randall's Bay. We had the sun on our backs and the sailing bit between our teeth, and chose to push on. 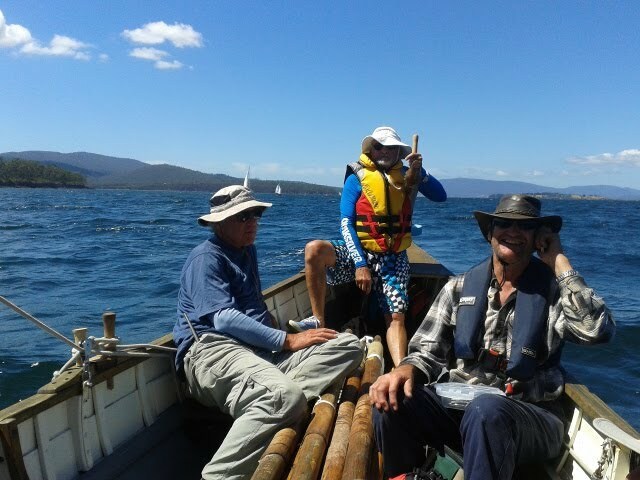 It was a good decision - even the slowest of the boats (Swiftsure) maintained a steady five knots all the way to Port Huon and beyond. In an audacious attempt to steal a march, Swiftsure took the eastern channel to the Egg Island canal, but it turned out to be a scenic 'longcut', and she arrived back at the wharf a little after the other boats.